App Builder Appy Pie, March 19, 2018: So, you have an awesome app in your hands and you launched it with great pomp and show, and even managed to taste and enjoy some amount of success in a wide sense of the word. You have reached a good landmark when it comes to the number of downloads, but now you seem to be stuck, and the number just doesn’t seem to budge, or worse goes down! The attention spans are at an all time low, the demands are only reaching the skies and beyond, and the competition today knows no bounds. These factors do not only offer a huge market and potential, but also lends a sense of urgency in building a strong user base, retaining their interest in your offerings, and keeping them engaged for as long as possible. This, as we have mentioned earlier, is no mean feat! Which features are their favorite features? Which places, or features are they struggling with? Where are you getting the largest number of downloads from? The end objective may range from gaining more downloads or get the users to spend more within your app, app analytics and the ensuing insights will get you there. If you use the right kind of software, then you can analyze the in-app user behavior and buying habits. Once you have all this information at your disposal, you have the scope to tweak the app and then massively improve your results. The process, that has often been termed as app conversion optimization has proven to be of great use for the app developers who are looking to expand the impact of their app and extend its influence over a larger number of users and engage them for longer periods of time. It is a process that is undertaken to make certain adjustments or tweaks (including both major & minor ones) to an app with the intent to get a higher conversion of ‘Objectives’. This ‘Objective’ would essentially be set or defined by you and can be anything from getting a user to click on a particular link or opting-in for a newsletter or make a purchase within your app. There are a great number of mobile app analytics tools available today in the market, and it is your final objectives that would shape your decision of choosing one over all others. It can be quite a conundrum for most people, which is why Appy Pie is here to help! We have listed hereunder a list of top 10 mobile app analytics tools for your benefit, and have talked about their strengths and weaknesses, so that you can make an informed decision on the basis of your requirements and preferences. Google Analytics is one of the most powerful analytics tools for both desktop and mobile apps and websites. This free tool has managed to help a huge number of app developers track the performance of their apps seamlessly irrespective of the size of their market, the total number of your app downloads, or the traffic you generate. Localytics is one of the leading experts when it comes to offering meaningful insights by way of mobile app analytics. This is one tool that helps you express your love for all your customers by understanding what they seek and what they expect from you, and then making the necessary changes in your app to meet their expectations & demands. Each one of your app user must have significance in your scheme of things when it comes to your mobile app and its success, hence each one of them deserve an unfeigned relationship with you. If you shy away from this and skip this important step, you are effectively doing a disservice to this loyal community who are instrumental to the success of your app. Localytics is unique in the analytics tools category as it comes with great features that will help you with every aspect and detail of marketing your app. Some of the more prominent features that it includes are in-app messaging, push messaging, life-time value tracking, A/B testing, segments, funnel, and a whole lot of other features of great value. 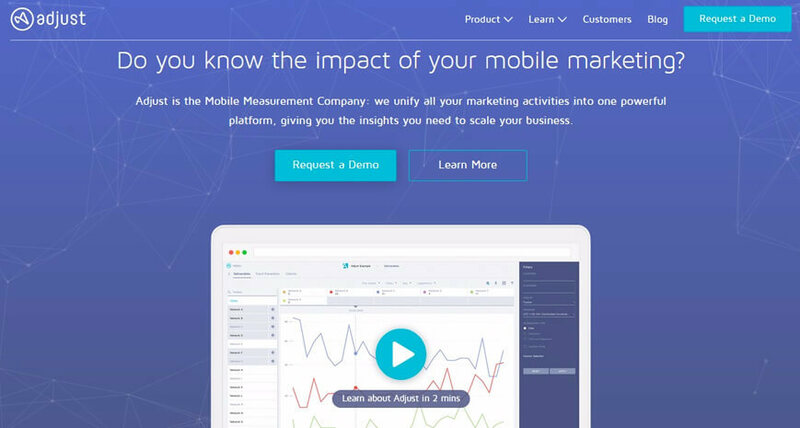 Localytics, the popular mobile app analytics software can be scaled to track up to 100 thousand monthly active users and 12 million data points. It has the ability to keep track of granular analytics, user flows, and funnels. Additionally, it also offers A/B testing and your own dedicated account manager in addition to marketing automation, however it has a limitation in terms of the file format, as it only exports the data in PDF or CSV formats. It supports all the major mobile platforms including iOS, Android, Windows, Blackberry, and HTML5. 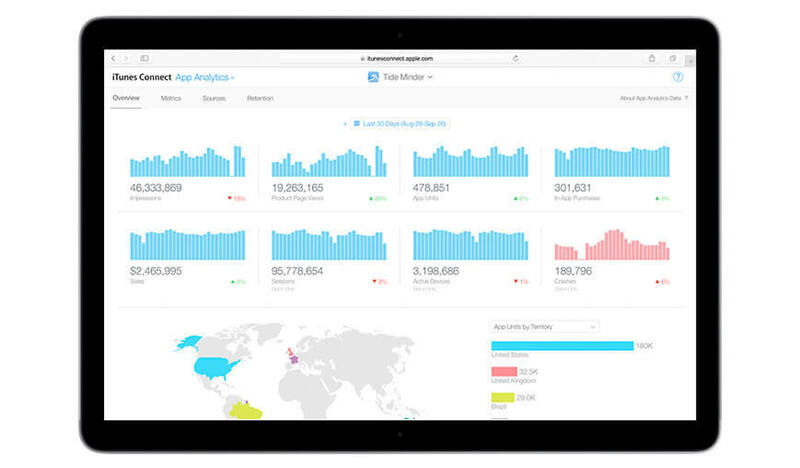 Apple Analytics or Apple App analytics is a free tool for the iOS platform and was introduced in 2005 with the intent to handle three basic sets of data viz. the Usage Data, Sales Data, and the App Store Data. 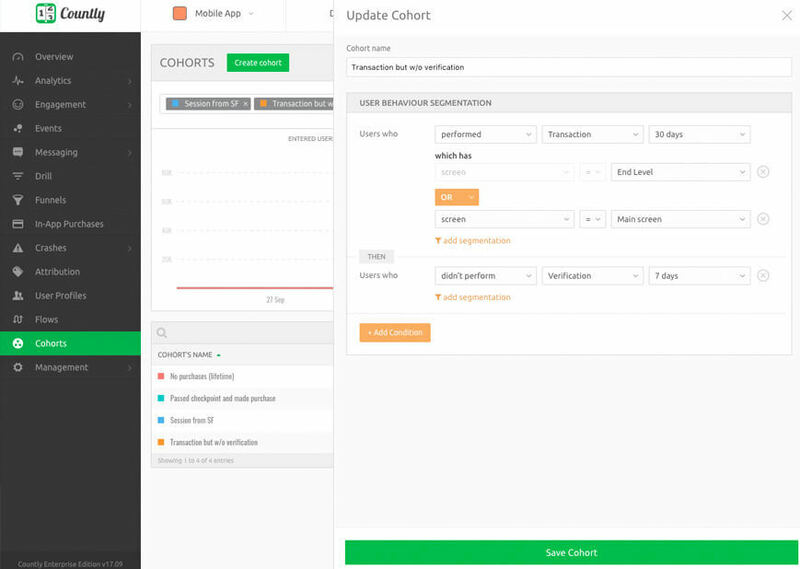 This exclusive tool for mobile app analytics furnishes the user retention information right on the dashboard and even shows the users who are dropping-off. With Apple App Analytics, you would have, at your disposal information about the number of returning users, numbers of downloaded apps, information about apps that were uninstalled, and the number of people who watch your preview videos. If you take the pains to study this goldmine of information and user insights, you are bound to make mobile marketing decision that are smart and help you increase your sales. The best part about it is that it is free, which means that you don’t have to burn a hole in your pockets in buying a mobile app analytics tool. If the intent of analytics is to drive traffic, build engagement, and discover opportunities to increase the revenue you are drawing from your mobile app, then Tune probably is ideal for you. 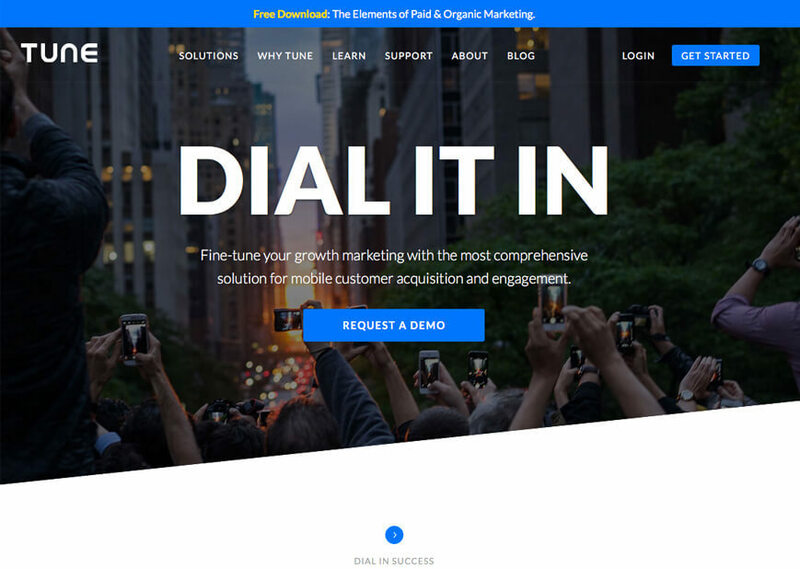 An analytics platform largely focused on marketing, Tune is equipped with app-store analytics in its ‘console’ and is available for free for a limited trial period. The essence of mobile apps marketing is knowing which customers or users one can rely on, and Tune can help you track them. Tune lends you massive opportunities for growth and various aspects of mobile apps engagement that may be tracked with it. Listed hereunder are the most lucrative of the benefits of using Tune. It has been established through studies that only about 4% of the app visitors actually convert to leads. Tune has the potential to help you strategize effective campaigns and re-engage the casual visitors and convert them to users by putting forth a report that has a positive impact on your decision-making process helping you understand your customer better and attain higher sales. Countly or Count.ly is a comprehensive mobile app analytics tool that encompasses everything including push notifications, user profiles, attribution to segmentation with real time analytics of up to 10 million unique identities. 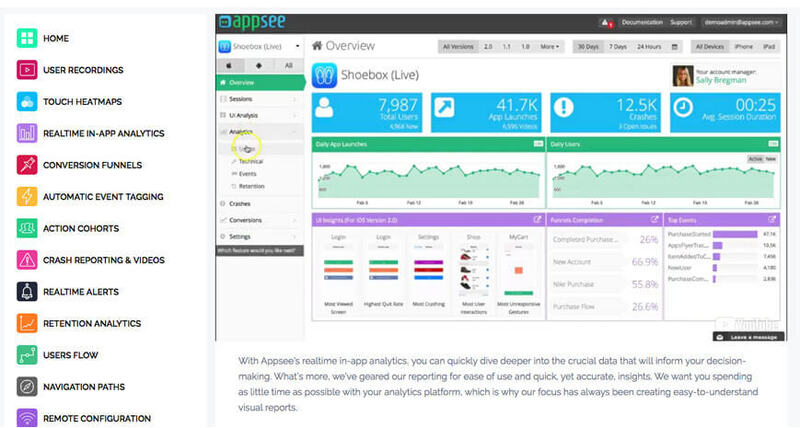 What sets it apart is that it is an open source mobile apps analytics tool for all the leading platforms including iOS, Android, Windows phone, and BlackBerry. Its dashboard is one of the most user friendly ones that displays sessions, new users, event served, and the time spent, and this tools is particularly effective in retaining your customers. It has been established through studies that it is 25 times more expensive to acquire new leads as compared to retaining the existing ones. Countly monitors the actions of the customers by monitoring their actions and offer a review that ascertains their experiences with your app. Equipped with a fast, light, and responsive user interface and supports some of the world’s leading app platforms including SDK and Appcelerator, titanium and unity3D SDK. An effective and useful mobile analytics solution – Bango analytics is a product of the revered & trusted mobile enabler company Bango. It is known for its ability to deliver accurate customer insights that are exclusive to them. What really sets them apart from the rest of their competitors is that it can track individual links which might be of great use for certain purposes like may be managing an ad campaign for your app. 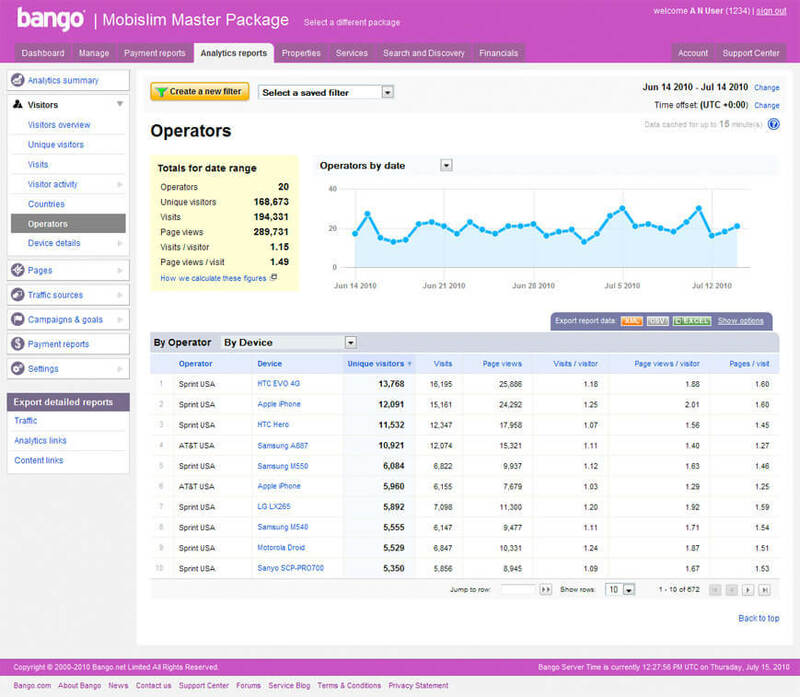 This tool also allows you to track individual visitors. Bango assigns unique user IDs for all its visitors which ensures a high accuracy & independently measures each of your mobile ad and marketing campaigns to maximize your ROI. One great advantage of using Bango is that it is possible to integrate their analytics platform with the leading mobile operating systems including Blackberry, iOS, Android, Palm, Windows Mobile, & Symbian. If you are looking to gain an insight about those areas that your users love to use and visit, or intend to draw out value through insight from your customers’ behavior, or want to know what is it that motivates your customers, then Clicktale is perfect for you! When you track your customer or app users’ journey efficiently, it is bound to reduce the churn. Clicktale can help you enhance your customers’ satisfaction in an effortless manner. Clicktale leverages visualization and usability features that you can rely on, instead of mere guesswork. 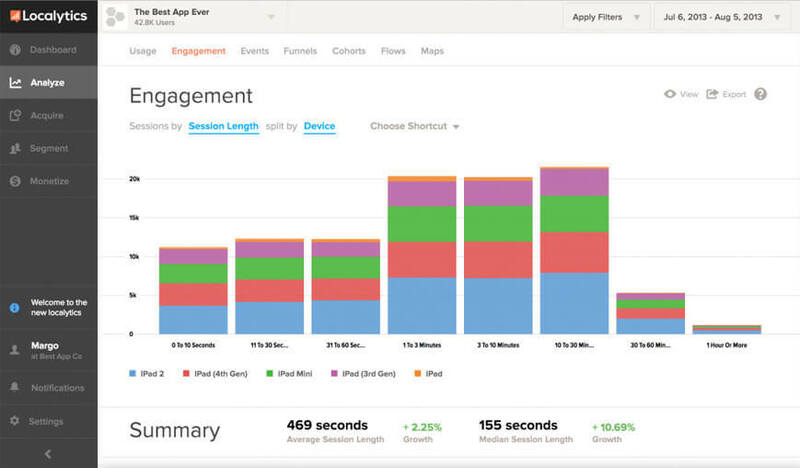 It lets you see what your app users do exactly, when they are using your app. The data can be visualized to indicate the areas with which the users tend to interact the most, and which features or elements of your app do not receive the attention you were hoping for, so that you can make the changes needed in order to enhance your app. An advanced analytics platform, MixPanel has an illustrious list of revered clients including but certainly not limited to AirBnB, miniclip, WordPress, Match.com and more. MixPanel is especially good for real time data, funnel analysis, in-depth analysis, and cohort analysis. One of the most amazing features of this tools is its ability to combine both mobile and web analysis! MixPanel can prove to be particularly effective at retaining the existing customers. It has been established that customers who have made a purchase with you are more likely to return for additional purchases, so when you retain a customer, you boost your sail and increase your overall revenue. It has a great number of analytical tools including funnel analysis, cohort analysis, marketing automation, and a lot more. The only drawback is that it does not have a live demo. This one is a great tool that has an exceptionally easy to integrate SDK that offers unique features including touch heatmaps, crash recording, recording with playback and in mobile app analytics. One of the most intriguing aspect of AppSee is that it can use past user data and then develop events, which is of especial importance when it comes to conversion funnels. It allows you to target your customers by creating events that are of relevance to each of your customers on the basis of the data gathered about your user. Audience targeting increases the chances of bringing about an increase in your sales. It is quite a light SDK, but it is iOS & Android only. Adjust claims that it can help you ‘adjust’ your average mobile app performance to spectacular! It gives you a unique insight into your marketing campaign. It is well established that when you have, at your disposal relevant customer feedback, you have in your hands the power to build a strong brand that would stand the test of time. Adjust – an attribution and analytics software package for mobile apps, has the potential to enable mobile app marketers to examine store statistics, advertising sources and advanced analytics to fully monetize their application. The tool supports iOS, Android, BlackBerry, Windows Phone, & HTML5.